Idaho is experiencing a growth spurt unequaled since the days of homesteading, free mining claims, free cattle grazing, and water rights. Guess what? The modern version of those government give aways come in all sorts of “economic incentives” which has local citizens PAYING corporations to move businesses to the Treasure Valley and the rest of the state. On the face of it growth sounds good. The problem comes when businesses come here to do things they couldn’t do elsewhere. Things like pollute with dairy cattle waste that wouldn’t be allowed in California. Or pay lower wages than California, Washington, and Oregon–or about 90% of the states in the USA. They bring more workers with them which drives up the price of real estate. Nice if you want to sell, but bad if you want to buy. Politicos love the real estate boom because it means higher tax revenues, but the increase seldom pays for the problems caused by growth. Some IDAHO FREEBIES listed here. Price Pump Manufacturing Co., an 86-year-old company that has operated in Sonoma County, California for 70 years, bought 6 acres of land in the Sky Ranch Business Center for about $86,000. The area is part of Caldwell’s urban renewal district, so none of the taxes on the planned 40,000 square foot facility will go to Caldwell to pay for police, fire, sewers, etc. Caldwell citizens will have to foot the bill. Caldwell schools will have to make room for new students as well. This scenario plays out weekly through Idaho and it is ruining a lifestyle, culture, and ultimately a society. As a certified GROWTHOPHOBE, the GUARDIAN has long welcomed any company or individual to our state as long as they pay their fair of taxes and don’t come for the welfare benefits. We would never PAY individuals to relocate here, grant them 75% tax exemptions, and claim it is progress to increase the population. 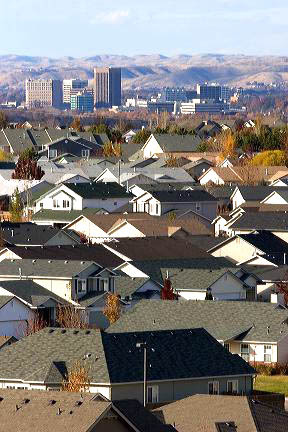 News reports show the median price for homes sold in Ada County during the first quarter of the year was $297,000, while the median price in Canyon County was $201,100, according to a report from the Intermountain Multiple Listing Service. In Sonoma County, the median price in March was $639,000, double the price five years ago. The City of Meridian pays the new private for-profit Idaho College of Osteopathic Medicine $50,000 a year and plans to forgive $100,000 in building fees. They created an urban renewal district out of a cornfield so Gardner Development could build the new Paylocity building which is said to attract 500 new jobs. They will get benefits similar to Price Pump. Meanwhile West Ada Schools will be forced into another expansion funded by existing residents. While the politicos all crow about Idaho being “business friendly,” they fail to admit the problems they are creating for we citizens. Nampa residents are on the hook for more than $200 million in sewer improvements, Ada County County Highway District has ever increasing demand on the road network, and air quality frequently rivals that of the Los Angeles Basin. The tired old refrain of “you can’t stop growth” is simply ill informed drivel. Stop paying to increase the population, stop changing zoning master plans to encourage development, and respect those of us who have lived her our entire adult lives. We realize “things change,” but downtown Boise is looking like “Anywhere USA as the sky and foothills are replaced with bricks and glass. Road construction is at an all time high in Ada County with 90 projects being completed this summer by ACHD. Many of these projects will widen roads and intersections in the hopes of reducing congestion. This may be work for a bit, but this is a “build and they will come” problem. 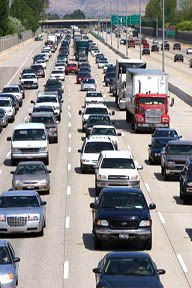 Congestion will return as there are few other alternatives. Google “induced demand” for further reading. I couldn’t agree more. Our workers are underpaid, our residents foot the bills for new infrastructure and schools and the businesses that come in often bring their own workers! The free ride is over. Each and every development should pay impact fees for all services needed to “restart” in Idaho. Skyway Elementary, in Caldwell, just east of the Sky Ranch Business Center, is one of the poorest schools in the Vallivue School district and has a regular food bank for the children’s families. One wonders if the Idaho Freebies are a major contributing factor to all of this and if there is truth to the saying that poverty is by design to control a population. To have a decent wage you need to leave Idaho or be a business owner and take handouts. I grew up in the Los Angeles basin, and my backyard in the 60’s went straight out into orange groves. They kept widenening the roads as traffic got bad, saying it would improve traffic flow. Doesn’t work. A couple years later it needs to be widened again, then again; repeat till you live in a totally unliveable, smog choked, crime infested ghetto. That’s why I moved to Boise in 1990. Slow way of life. Great town. I finally bailed out two years ago, and relocated in a very small town in a beautiful place. Much better, and the land use policies in my new town don’t allow sprawl. Time to rise up with the pitchforks and grease the guillotines. Your politicians and their billionaire puppeteers have become the equivalent of mafia crime lords on a mission to destroy Boise. It seems we need to get beyond scattered complaints and piecemeal protests. It seems we need to unite across various neighborhoods, diverse personal circumstances, and differing national politics. So I started a Facebook page — Keep Boise Unique — as an independent resources to begin discussions and get to solutions for Good Growth. As far as I know, this is the only place in town that is really addressing our crisis in Boise in a way that is both comprehensive and particular, practical and visionary. I’m getting discouraged, though, with the lack of response and support. I invite everyone to check out my page, which is presented by merely an eccentric writer of iffy health who is unhappy with both political parties. This may be somewhat of a last appeal. It’s not about me. The important thing is that others may yet step up to unite all people of good will in the Treasure Valley in accord with traditional American values regarding faith and family — with common sense, common decency, and common kindness. I’ll try to give my best support to anyone who will truly try to nurture an authentic solidarity that seems so urgently necessary to Keep Boise Unique. Alex Jones has a great point! “It really is ok to ask those benefiting from our ‘boom’ to pay their fair share”. Mr. Farmer, you sold your 160 acres at a TREMENDOUS profit, please pay your fair share. Mrs. Realtor, who has sold houses for the past 30 years, please your fair share. YOU should pay more for new schools according Alex. Mrs. Restaurant owner in downtown, the one that has been there forever, YOU should pay your fair share as all these new people add to your PROFITS. Idaho Sand & Gravel, you are getting a pay-up invitation too. Yes, family owned car dealership selling cars to all these newcomers, you too should pay your fair share. ALLL those property owners like Boise Escapee, and ALLLLL those business owners, and ALLLLL those employees gainfully employed for the past 8 years, please PAY-UP. ALLLL the old-time residents benefitting from the growth, need to pay their ‘fair share’– according to Alex, that must be MORE. The new people haven’t even been here long enough ‘to benefit’… so who’s paying? The LIST of people profiting on this growth is lonnnng. Alex, you might want to get busy asking those people to pay-up. As to poor schools, please inquire with schools in more rural areas with DECLINING populations as their percent of food bank usage. Boise Escapee(s) will run out of places to go someday. So does Idaho Pump and Pipe (been in Idaho 40 years) get the same deal or do we just help California companies? The deal is not fair to Idaho companies. I thought conservatives do not believe in government paying to create jobs? It is supposed to be low taxes and free enterprise, and government not interfering in anything – including not funding the public school buildings. Idaho Dept of Commerce screams about wanting to bring high wage jobs, but to qualify for Idaho’s incentives, it is enough to pay the average wage in that county. Something smells rotten in Idaho – in fact, all kinds of stuff. Besides providing this one corporation a lucrative business incentive package to relocate from California to Idaho, the government leaders rationale for taxpayer giveaways: job creation – is not even happening. They apparently are not only bringing 18 of their 35 full time employees with them, but are actively recruiting more Californians to hire and pay to relocate to move to Idaho – where they promise this potential workers, you can still achieve the “American dream”. New Director of Idaho Dept of Commerce used to be Otter’s SCHEDULER for 7 years. Prior to that she was many things including part of IDAHO INVASIVE SPECIES COUNCIL. In Idaho, it is considered “CHANGE OF LEADERSHIP”-LOL. The ad in SanFran for this company is VERY telling. That really sets a standard. Also displays the attitude of the Californians moving here… not so good. Somehow hiring a local person, to temporarily go to Sonoma for training, is not worth an ad in the Boise Craigslist? Guardian, please print and post that ad, to preserve it from being deleted. Expect full on frontal and backdoor attacks on existing water rights. It’s the most difficult limitation to growth in this valley. All the people from the TV talking heads to real-estate brokers to builder/developers to environmentalists to the politicos will be selling us on a new better water rights plan soon. The director of the Dept of Commerce would be lucky to be able to spell Commerce – let alone understand what it is and how it works. The entire Dept is the same way. Butch has done nothing but hand out jobs to his friends – Megan Ronk included. What a joke on both counts. It makes Butch look very petty and very self centered – which he has been. EDITOR NOTE–We have been getting messages that one of her past duties was on the INVASIVE SPECIES council! Great credential for the person who is in charge of doling out cash to attract the invasive businesses. It’s a strange life Mr Guardian… I was talking to a women at work yesterday that was mad about the growth in Idaho… but she had a refugees welcome bumper sticker on her car…..I have a feeling many of the refugees that are coming in are getting some of the same give aways that the big corporations get…. just on a smaller scale. Porcupine, those two points are so far apart they’re not even in the same universe. Editor – are you suggesting that those who get handouts from the Commerce Dept are “invasive species”? Not a bad assumption. It would appear that only those who come to invade get the payouts. Good comments all. This is an outrage. It is entirely proper to ask commercial entities to share equally in paying for amenities that they enjoy considerable benefits from. Why should tax paying residents and workers haul the load by themselves? If you are a big employer here to do honest work by us, then great, but pay your fair share, please. 1) Commercial interests know they can bully local governments into special tax breaks and free stuff, because only BIG business is allowed to create jobs anymore. The concept of promoting thriving small businesses is now a anachronism that enjoys lip service in political campaigns, where the fact that setting up a successful mom and pop is rife with burdensome financial and regulatory hurdles. 2) The ironic phenomenon of Californians escaping that cesspool and flocking to Idaho might carry the same disease to this oasis of open freedom. This is not a given. Many Calis come here to seek what we have in lifestyle and have no intention of altering it. But, there are elements that will transport their bad habits and commie culture to Idaho as well. Team Dave is only so happy to embrace this. 3) How we tax has become very regressive. If you are a long time native resident, keep to yourself and play by the rules, you have to subsidize changes that you DON’T agree with, most of the time. Property taxes basically say that you never truly own your own home or land. You get nicked for just existing. I believe that we should throw away ALL forms of taxation and produce a consumption tax that nicks every payment/settlement event at about 1 tenth of 1% of every P/S. This would yield many times over what all our taxes currently yield, without any massive bureaus needed. This would lower the taxes of 90 to 99% of us and grab trillions of untaxed dollars from the shadow banking community. 4) New political paradigm. There are no more liberals vs conservatives. We are seeing the realization that most people are populists and they are fighting whacked out elitists. Look at this NXIVM indictment. Sicko elites and movie stars are engaged in horrific acts and are politically connected to those more foul in government, in occult dealings. These are the whackos making all the important decisions. Normal people just want to be rid of this. We don’t want to subsidize it anymore. We want our country back, if we ever had it to begin with. The NXIVM deal is just the tip of the iceberg and there are 25,000 more indictments to unseal. Bottom line is, we need to vet what our growth looks like. Don’t let human trafficking rings get any more of a hook in Idaho, than they already have. This is the poison that influences the centers of power. Mulled over the idea of these tax incentives for business relocating here, and have found some insight. It is offensive, first and foremost, and it puts existing business at a huge disadvantage. But, here goes. On the other hand, let us suppose there is demand for a product or service in the area, say a plumber, architect, or physician. If you are qualified and trained in those areas, you will face tremendous start up costs and will likely barely make it for a while, therefore not contributing much in the way of income tax. You will still be hit paying property tax though. You will struggle to pay your employees. Coming and being asked to bring your employees should say right off the bat that there is not a qualified work force for you to hire. And, California is a nice place, but not everywhere. Some parts do have problems just like Boise because excess income in some sectors like tech. and med. push prices up. Don’t have real answers other than vote the bums out. Exactly what kind of community do you want to live in? I’m not a fan of all the people coming, but I don’t know how to stop them. I won’t shop at the Village, just to show my displeasure. And I shop at the D&B in my neighborhood, because they reused existing construction and are locally owned. Maybe if more people did this, the edge would come off the crazy. But I’d also like to live in a community where providing the type of education called out for in the state constitution is taken seriously. And I love the open space we’ve preserved. How do we pay for that? I’ve voted multiple times to raise my personal taxes (at the Federal, state, and local levels). I understand it takes money to try to preserve the type of community where I want to live. I do believe in impact fees and local option taxes. But neither are legal right now. If we are going to have growth, I believe it should pay for itself. But since I can’t stop growth very easily, I’m willing to put my money where my mouth is. Why aren’t you? Just so tired of the “I got mine, the hell with the rest of you” attitude that pervades my country, and especially my state. Yossarian 22 – You nailed it. The average Joe is being played, and the phony left/right, R vs D paradigm is nothing but a method of enabling the powerful to render the voting public impotent – leaving them to carve up the spoils for themselves. Big corporatism and big interests dominate – and it’s not positive for the country.